Back in 2014, Ubisoft released two major Assassin’s Creed games: one of these was Assassin’s Creed Unity, the first game in the series created specifically for the new-gen consoles, while the other was Assassin’s Creed Rogue, the last game in the franchise to hit the old Xbox 360 and PS3 consoles. Of course, you can imagine it was Assassin’s Creed Unity that got the most publicity and attention, while Assassin’s Creed Rogue, despite selling pretty well, ended up being relegated to the sidelines. This is a game that many Xbox One and PS4 owners likely did not get a chance to play back in the day then, and for these people Ubisoft has released a remaster of the original game, titled Assassin’s Creed Rogue Remastered. As is the case with the original release, Rogue is a decent Assassin’s Creed game which really doesn’t excel much when it comes to characters and story, and is difficult to recommend above other Assassin’s Creed games, especially its predecessor Assassin’s Creed IV: Black Flag, a game this obviously borrows much from. 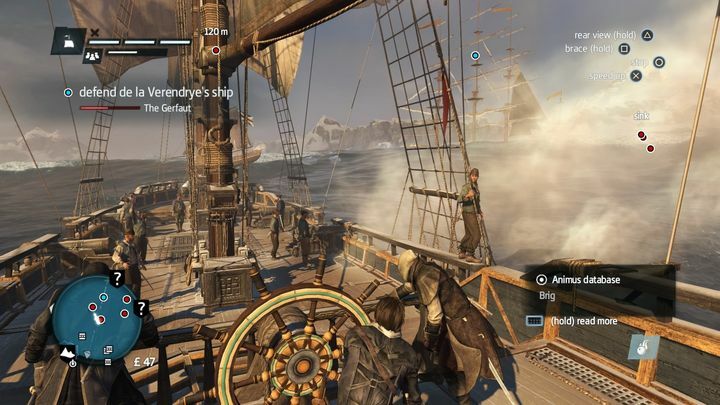 Actually, like in Black Flag, sailing is a key component of the game, and you get to cross the seas aboard protagonist Shay Cormac’s ship here. Unlike Ubisoft’s earlier game though, this doesn’t take place in the Caribbean. Rather, you get to navigate the icy waters of the North Atlantic instead. While sailing, you can also zoom out and get a great view of the ship sailing the oceans, while there are four different speeds to choose from. It’s hard not to notice this feels like changing gears in a racing game most of the time though, and overall it’s clear that this is no sailing simulator. The ship battles are also a blast here, and shooting enemy ships to bits with your cannons is a lot of fun. You also have a puckle gun mounted on your ship at some point too. Using this to fire at weak spots on enemy ships, or for taking out enemies when boarding enemy ships, sure is entertaining. Boarding ships is as engaging as it was in Black Flag, and this lets you go toe to toe with the enemy crew in a swordfight. Sword fighting sure feels great, even though this features the typical “paired” combat system seen in all Assassin’s Creed games since the first, and not the more refined combat system featured in last year’s Assassin’s Creed Origins. The naval combat is as great here as in the earlier Black Flag game. This means enemies will stick close to you in a fight, and it’s impossible for your strikes not to hit (enemies can block your attacks, of course), while foes will take turns to attack. It’s not very realistic, but like the naval combat, still quite a bit of fun too. But while navigating the waters and engaging in naval combat is as entertaining here as it was in Black Flag, it’s a pity the game’s characters are not so great. This includes protagonist Shay Patrick Cormac, an 18th century Irishman plying his trade in the middle of the Seven Years’ War, a conflict between the French and British in North America, meaning this game is set before the events taking place in the earlier Assassin’s Creed III game. Sadly, Cormac is an average protagonist in the series. He’s only a few points above Assassin’s Creed III boring Connor, and definitely no match for captain Edward Kenway of Assassin’s Creed IV: Black Flag, a game this borrows so much from. Another interesting thing here is that Shay is already a member of the Assassins at the beginning of the game – this means you won’t have to endure any unnecessary long tutorial section or initiation rites here. Nonetheless, you still get to learn the basics about fighting and other aspects of the game initially though. These training missions take place in the homestead region, which you might remember was Connor’s base of operations in Assassin’s Creed III. Here, you will be trained at shooting targets and stealth kills by three different Assassin characters. Stealth gameplay in Assassin’s Creed Rogue is largely the same as in earlier games – you can hide in the vegetation (bushes for instance) and whistle to attract the attention of guards, killing these when they get close enough. You can also perform stealth kills from above, waiting for enemies to walk below you before pouncing on them and killing with your Assassin blades. This comes in handy in the game’s various assassination missions, such as an early one in which you have to kill a sickly Templar character named Lawrence Washington, a man who’s in possession of a mystical object the Assassins want for themselves. 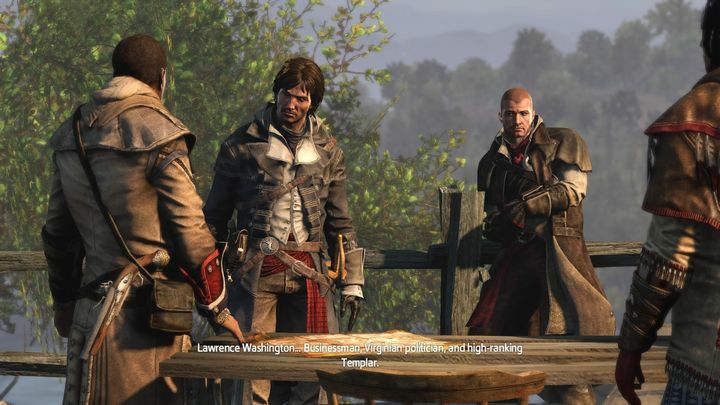 Shay Patrick Cormac (second from left) is the protagonist in this Assassin’s Creed game. Of course, as you might already know the major plot point in Assassin’s Creed Rogue (which also gives the game its name) is Shay’s betrayal of his fellow Assassins in order to join the Templars, and much to the game’s credit, Shay’s transformation from loyal Assassin to vengeful Templar is handled in a convincing way here. Shay begins to distrust his Assassin comrades early on when one of his superiors (a despicable character named Verendrye) tells him that being an Assassin means, amongst other things, “obeying your mentor without question”. But it is not until later in the game when the tables turn, and Shay realises he might be fighting for the wrong side. This happens during a mission taking place in Lisbon, which no doubt is the highlight of the entire game. Without spoiling anything, let’s say Shay will be running for his life soon after retrieving an artefact from a church, with the fast-paced sequence that follows being one of the best in an Assassin’s Creed game to date. This event convinces Shay there’s more to the Assassins than meets the eye, and that the Templars might not be so bad after all, pushing him into a confrontation with his mentor Achilles. This ends with Shay fleeing the Assassins’ Davenport headquarters for good, and ending up in New York. Strangely enough, the story takes a dive after Cormac betrays the Assassins, with his time with the hooded faction being the most interesting part of this game. 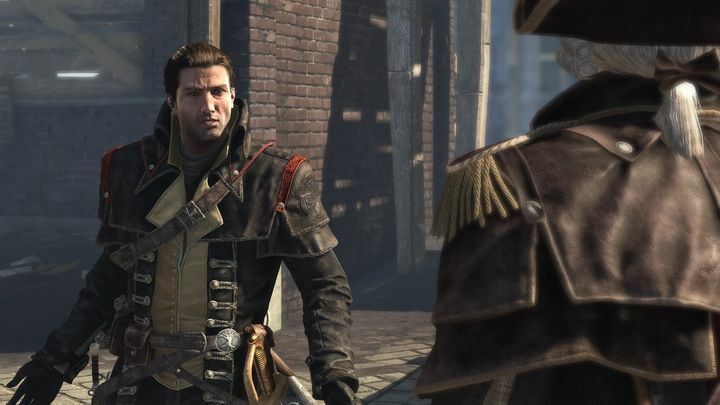 Part of the reason for this is that while the characters you get to interact during the Assassin part of the story (such as Achilles of Assassin’s Creed III and Adewale from Assassin’s Creed IV: Black Flag) are engaging enough, that’s not the case with the characters you meet on the Templar side. Actually, a Templar colonel you end up working with throughout the game is a boring, uncharismatic character, and so is Haytham Kenway, a returning character from Assassin’s Creed III. The Templar Grand Master was one of that game’s highlights, but ends up being strangely dull here though. So, while the Templar part of the story does have a few highlights, it seems Ubisoft has been making games with Assassin protagonists for so long it could not make protagonist Shay Cormac’s life as a Templar interesting enough here, and the result is that Assassin’s Creed Rogue’s story becomes something of a slog after the first third. At least the modern day part of the story is enjoyable enough though, and is a nice respite from Shay’s adventures in the 18th century. Actually, while in the most recent Assassin’s Creed games the present-day bits have been little more than an afterthought, the modern day gameplay in Rogue (which is set in the offices of Templar corporation Abstergo) is quite engaging. Modern day segments are quite fun, and offer a nice break from the historical action. Here you get to wander Abstergo’s offices and solve some simple puzzles. Solving these gives you access to video files and sound recordings which shed more light on what’s happened in the Assassin’s Creed games to date, and these sure are fun to watch and listen to, especially if you’re a long-time fan of the series. Meanwhile, Assassin’s Creed Rogue also boasts a few gameplay innovations. In the sailing portions of the game, small icebergs floating around can be shot to bits, and this will unleash waves that can seriously damage small enemy ships, adding an extra dimension to the naval combat. Also, the cold waters of the North Atlantic have an adverse effect on Shay’s health, and you can’t go swimming for long before this begins to drain your health bar. Aside from these details though, navigating the North Atlantic doesn’t feel that different to sailing across the Caribbean in Black Flag. Aside from destructible icebergs and the fact that swimming in the icy waters of the North Atlantic is now adverse for your character’s health, the game also adds an interesting new weapon in the air rifle. 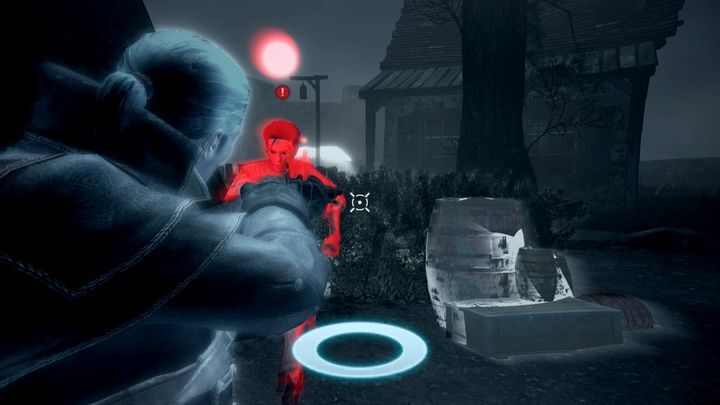 The air rifle is a new addition to the franchise, which can shoot darts, and also grenades and firecrackers, the latter being useful when dealing with a new kind of enemy introduced in the game. While roaming around New York’s streets (the major urban area you get to explore here), you also have to be wary of stalkers. These are hidden enemies that will attack you quickly if you wander near their hiding place, and do a substantial amount of damage. Luckily though, the game gives you the tools to deal with these hidden killers – all you’ve got to do is listen to their whispers (which indicate there is a stalker nearby) and rely on an onscreen compass to figure out the direction the sound is coming from. When you’re close enough, you can turn on eagle vision (which as in earlier Assassin’s Creeds shows enemies marked in red) to discover their hiding place, and fire a firecracker with the air rifle to make them get out of it. But while doing all this definitely is fun, the whole activity feels slightly out of place, more fitting for a vampire-hunting game than Assassin’s Creed, so it is no surprise it has been banished for good in later games in the series. Aside from a few gameplay ideas, as in previous Assassin’s Creeds, there’s a wealth of side activities for you to pursue here. Like in earlier games, it’s hard to tire of synchronizing viewpoints here, and since this reveals the location of points of interest on the map, it’s definitely worth doing. Hunting stalkers is fun, but feels slightly out of place in this game. Other side activities include looting chests found all over the North Atlantic region for cash, and picking up collectibles scattered throughout the map like Animus fragments. Picking up these (which are blue, shining objects floating in the game world) is an optional activity that kept me busy for a while during my playthrough. You can also find Templar maps which point to the location of buried Templar crosses, and finding and unearthing these is enjoyable, while another side quest has you collecting fragments of a Viking sword all over the game world. If you’re the sort who enjoys picking up collectibles, Assassin’s Creed Rogue can keep you busy for a while, that’s for sure. The problem is that the earlier Black Flag also featured these side activities, while being a superior game overall, so it’s hard to recommend Assassin’s Creed Rogue Remastered based on this alone. This being a remaster, logically it also features improved graphics, although you shouldn’t expect anything close to last year’s Assassin’s Creed Origins (which was arguably the prettiest game of 2017), of course. Having taken a look at the PC version of Assassin’s Creed Unity (the other Assassin’s Creed game which came out that year) recently, it’s clear this PS4 remaster of 2014’s Assassin’s Creed Rogue is not close to that when it comes to graphics either. The game is pretty enough though, with nice looking vegetation, skies and wildlife. And as can be expected, the waters of the North Atlantic look pretty real too, as do the rain effects, while character models are decent but nothing else though. However, the title music and that heard in the menus is some of the most uplifting and dreamy I’ve heard in a video game to date, although in-game music itself is just OK compared to what has been heard in the Assassin’s Creed games to date. Overall then, Assassin’s Creed Rogue Remastered is a decent entry in the series, but one that is hard to recommend to those who have not yet played earlier games like Assassin’s Creed IV: Black Flag (which is bigger and better in every sense), while it’s also not a patch on the likes of Assassin’s Creed Unity when it comes to characters and story. The gameplay here is solid enough though, so you might still want to add this remaster to your collection if you’re an Assassin’s Creed fan who did not get a chance to play this back in the day.